It’s 20XX. A super robot by the name of Megam…no wait, that is the opening scene from MegaMan 2. It is however 2016 and it’s a time for our gaming group to look forward, because a new year means new games and there are a lot of amazing games scheduled for release this year. Be it games that we really know little about such as Detroit (Dev: Quantic Dream), Witness (From Braid creator Jonathan Blow) and ReCore (Comccept, headed by Keiji Inafune) or be they majorly anticipated titles like Hitman (SquareEnix), Doom (Bethesda) or Mighty No. 9 (Kickstarted by Keiji Inafune). With those, and a deluge of other titles on the way,three of our gaming gurus, Mansa, Doug, Aitch and I have taken a moment to put our thoughts to paper about our most anticipated game of 2016. Lets start off by checking in with Mansa and then we’ll hear Doug’s thoughts. 2016 has some amazing games set to arrive, yet the one I am the most anticipating is Tom Clancy’s The Division. The Division an open world, 3rd person shooter RPG set in New York City, which has been devastated by a weaponized virus. The Division, a tactical unit that has remained in the shadows, now has been tasked with the restoration of New York City. Loaded with advanced weaponry and tactical assistance, you and your Division teammates must fend off gangs, ex-cons, sickness, and more as you discover the reason behind the virus and retake the city. The game looks phenomenal thanks to Ubisoft’s new game engine called Snow Drop. Snow Drop has allowed the game’s creators to create a fully interactive city. From changing weather patterns to fully destructible environments, and even time of day the game world will constantly evolve. Though The Division seems to focus on co-op play, it seems there will be chances to go solo in places called dark zones. Dark zones will be areas in the game with the best loot. Dark zones are lawless, so there’s potential for some PvP action, meaning you can even kill your own teammates here; the choices are yours. The Division looks like it will have something for multiple types of players. With a March 2016 release date I’m getting ready now for my disappearance from reality. So if you need me during that time you’ll know where to find me. After going over the (fairly extensive) list of games that are coming out in 2016 for the PS4, I think that I’m most looking forward to getting my mitts on Horizon Zero Dawn. Developed by Guerrilla Games (of the Killzone franchise), and set in a distant future, this is a post-apocalyptic story about Aloy and her struggle to discover how and why giant, animal-like machines now rule the Earth, as well as what actually happened to the ancient civilizations (present-day man) that came before. This PS4 exclusive does not yet have a firm release date, although Guerilla Games has assured fans that it will be out in 2016. Put simply: This. Game. Looks. Gorgeous. In the trailer that premiered at E3 over the summer, we see a lush and beautifully detailed landscape. The game moves seamlessly from superbly-rendered cutscenes to smooth and well-paced gameplay, with no loading screens. I’ll repeat that: NO LOADING SCREENS. The trailer showed off stealth and action elements before launching into a battle that took place between Aloy and what can best be described as a giant metal Tyrannosaurus Rex. The combat and traversal seem like they’re going to be engaging and loads of fun for those who enjoy action/adventure games. Boasting dynamic weather, a full day/night cycle, smooth traversals, as well as stealth and action elements, Horizon Zero Dawn shot right to the top of my list. As a small side note, it feels weird not to be choosing “The Witcher 3” as my most anticipated game of the year, as it was for many years until it released this year, so now it’s time to find something new, which brings be back to Deus Ex: Mankind Divided. In all fairness I could be talking about any number of other games, but I chose this one because of my love of the Deus Ex franchise (yes, even you, Invisible War, I see you hiding back there). Though not all is hugs and puppies in the land of Adam Jensen, Square Enix having tried one of the biggest anti-consumer moves in recent memory, the “augment your pre-order” nonsense that Mansa and I discussed on an episode of Declassified a while back. Predictably it came back to bite them in the face. All that aside, I am still salivating for this game. Set 2 years after the Panchaea incident from Human Revolution, the world is even more divided between the Augmented and the Anti-Aug activists. 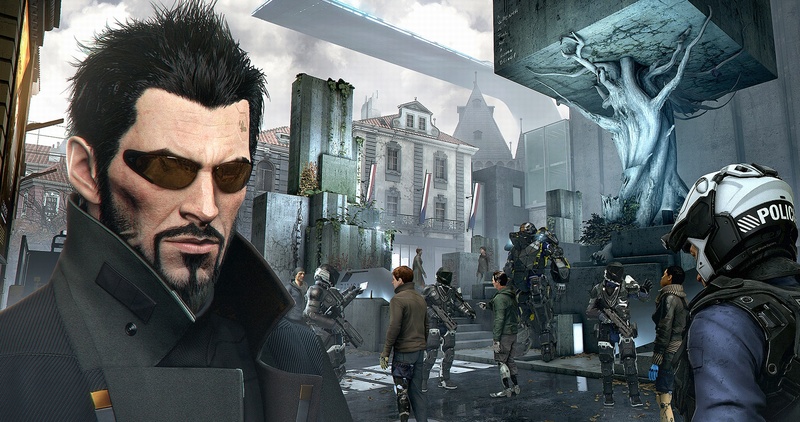 We take the role of Adam Jensen in the midst of what the game’s creators are calling the “Mechanical Apartheid,” where Augmented humans are rounded up and forced to live as second-class citizens. Some fight back like the caged animals they’ve become, while others try to work within the system, and form the group ARC, or Augmented Rights Coalition, whose motivations may or may not be in that grey area that higher powers love to manipulate. Running on Edios Montreal’s new Dawn Engine, the game looks slick and seems to retain that “choose your destiny” style gameplay; a game play style that lets you play the game your way. A style that has been sadly lacking in recent games that used to pride themselves on choice (I’m looking at you, Fallout 4). With updated roblox hack contact and social mini-games, and with a promise of much more robust combat should you choose that route, Deus Ex: Mankind Divided looks AMAZING. To be frank, I am really not excited about a lot of this year’s offerings. There are a lot of sequels coming and while Uncharted 4 is a no brainer for most of us, I am not seeing a lot of games even among the new IPs that I am truly excited about. I really won’t be excited until I hear of another Red Dead Redemption is in development. Even with the picks that I made, I wouldn’t be surprised if they got pushed back into 2017 but here is to hoping. First up is Mass Effect: Andromeda. A lot isn’t known about the game and we aren’t even 100% certain how it relates to Commander Shepard and co. from the last trilogy. We will be lucky if this game comes out this year as recently, Senior Development Director Chris Wynn left the company. What i do know is this was probably the best trilogies of any game I have ever played even if the ending fell a bit flat. No other game did what the Mass effect series had in which your consequences from the time you start a game in the first, will have consequences in the last. Even if it fall to 2017, this one will be worth grabbing. My second pick which I think has a better chance of dropping this year is South Park: The Fractured But Whole. To keep it short, if this is anywhere nearly as good as The Stick of Truth then this will be one of those rare times when not just one but 2 games based on another medium was successful on consoles. The Stick of Truth was my GOTY when it was release, will this new game be the same? Well that is a look forward into the video games of 2016. We’ll revisit this with some of our other gamers later on in the month. Do you agree with Doug, Mansa, and me, or do you have differing opinions on the games we listed? Let us know what you have to say below! Born in England and calling himself a "Nerd-of-all-trades" Ben can turn his hand to just about anything under the Nerd Umbrella. From Doctor Who to Pro Wrestling to comic books, old movies, gaming and more. I’ve got to say I agree with most of the picks. My only concern is Tom Clancy’s last game felt very lackluster to me, and i am seeing a trend with post apocalyptic war games becoming a trend with FPS games…i am concerned it might become BO3 or another series of humanity ending FPS’s. With that said the other picks are great choices!